Ordinary people doing extraordinary work. Carolina Timberworks crafts hand made timber frame and post and beam structures. We professionally install our timber framing anywhere in the United States. What makes this practical is the way we build our timber frames: we hand cut, pre-assemble, and carefully fit together your timber framing in our shop, then take it apart, label each piece, and deliver everything to your site–where it goes together surprisingly quickly. Why? Because we send the same craftspeople who built your timber frame to professionally and safely install it. They know every piece, have already fit your timber frame together once, and care passionately about getting it installed safely, when promised, and exceeding your expectations. 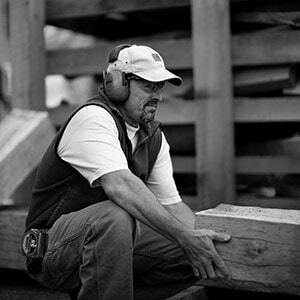 Carolina Timberworks is member of the Timber Framers Guild, the Timber Frame Business Council, and the Timber Frame Engineering Council. Many of our projects are located on the East Coast (from Naples, FL to the Hamptons to Newport, RI) and we enjoy traveling. Timber Grading, Installation for SIP Professionals, Safe Aerial Lift Operation, Rough Terrain Forklifts, Safe Scaffold Operation, Safe Forklift & Telescoping Boom Lift Operation, licensed North Carolina General Contractor, Certified AIA Presenter, NABSEP Photovoltaic installation, Entry Level.